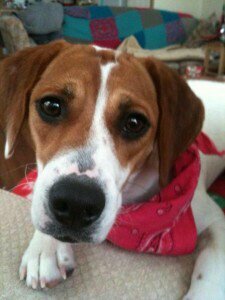 LOST BEAGLE: Windsor Junction — “Lucy” | Sack-Vegas!!!! Check this out. Link to Lost Dog Network Is at the bottom for more details. “My friend Megan was walking with her dogs and her young boy on the new Ashburn Golf Course in Windsor Junction this afternoon. She turned her back for a moment to push her son’s wheelchair and her young 9 month old beagle pup disappeared. Since the dog was last seen near a flooded section at a washed out bridge, they feel she may have fallen in the water and could have been washed out towards Grand Lake. Posted by Sacky on January 13, 2014 in Escaped Sacktown Critters.